Having a child with a chronic condition is frightening enough so thankfully Mediband can give you the peace of mind that when your child is not with you, their medical alerts are highly visible to the professionals when seconds count. My daughter is a severe asthmatic and my youngest son is allergic to stinging insects so I have always been terrified that if something happened while they were at home school co-op no one would know how to treat them in the event of an attack. 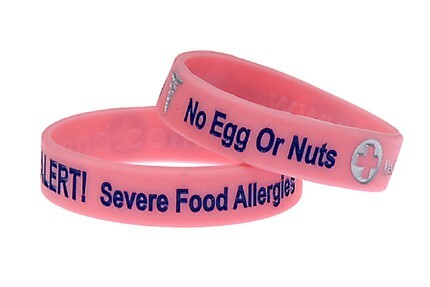 Mediband has medical bracelets for numerous conditions including Asthma, Diabetes, Epilepsy, Food Allergies and more. What makes these bracelets so special for your child is that they are fashionable and if they are like my kids then your child will actually want to wear it. Medibands are made out of food grade silicon and can be easily washed and sterilized. It is hypoallergenic and non-toxic and is designed to break if enough force is applied. I really liked that Mediband bracelets are soft and my daughter and son didn’t complain about it being uncomfortable as they have before with the metal bracelets. Their teacher at the co-op said they never even touched or played with the bracelets which is great since they are ages 3 and 4 and I was concerned they would take it off and lose it. If I forget to put their Mediband on when they will be away from me they actually remind me to get it now. Check out all the available Mediband bracelets for children. Starting at only $3.16 it is so affordable too. Can’t find exactly what you are looking for? Don’t worry…you can create your own Mediband. Mediband is a one stop shop for all medical alert bracelets needs not just for children but adults too.